I’ve discovered something that was rather surprising – that the ways we do things today aren’t necessarily the best ways to do them. As we look back in time we see that our ancestors had many ways of doing thing that have been lost to us today. While today’s methods meet today’s needs, they may not be the best ones around. There are many cases where the tools our ancestors used produced better results than what we manage today. You can still find many of these tools, often at garage sales and flea markets. People look at them as novelties today, but if we ever had to return to a simpler way of life – such as after the destruction of our electric grid – those methods would be the only way that we could do many things. Therefore, it makes sense for us to prepare today, buying the tools and learning how to use them. While there are still places where these tools can be bought new, they can also be found at garage sales and especially at estate sales. Often, the people who have them have no idea what it is that they have, so they are willing to let them go cheap. That gives you and I a chance to pick them up at a great price. Since we’re talking about homesteading, let’s start out with kitchen tools; there are a lot of them. An incredible amount of effort has gone into making the job of the homemaker easier, mostly because it is very profitable to do so. So the modern kitchen is filled with electronic appliances, many of which are highly specialized devices. But that doesn’t mean they are the best way to go. Cooking outdoors on the grill is one of the great American pastimes, especially in warm weather. It’s a great time to get together with family and friends over some good food. Cooking outdoors makes it especially nice, because we don’t have to heat up our kitchens. Only. . . we still heat up our kitchens.Maybe the meat gets cooked outdoors, but we still cook a lot in the kitchen. Why not cook all the rest of that food over the fire as well? With a cast-iron Dutch oven that’s easy, as it won’t be damaged by the heat from the coals. You can even bake in one, heaping coals on the lid so that the baked goods are surrounded by heat. When I was young, before the time of microwave ovens, pressure cookers were still fairly commonplace. Cooking under pressure causes water to boil at a higher temperature, cooking food faster. While it is not as fast as a microwave, the food comes out tasting a whole lot better. Anyone who is growing vegetables in their garden needs a food mill. This isn’t anything like a food processor, but rather more like a strainer with some emphasis on it. Purees, like puree of tomato, is pushed through the cone-shaped screen, providing an easy way of filtering out seeds, skins, stems and other solids. Not only does it work well, but it’s fast too. 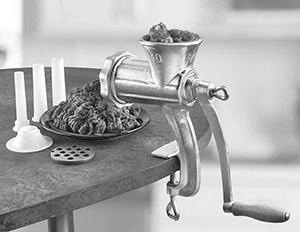 Whatever happened to the meat grinder? Once upon a time, you couldn’t have a kitchen without one. Not only did people make their own ground beef, but they used it to make sausage. The meat would be ground, seasonings added, and the meat run back through the grinder to stuff it into the sausage casing. Just about any type of sausage or lunchmeat can be made the same way. Salami, in all its variations, is essentially nothing more than a sausage that has been made this way, then left to cure. The salt and nitrates in the mixture are what cures the meat, preserving it. I’ve used many a juicer in my day and I don’t like any of them. At least, I didn’t until I brought a lever-arm juicer back from Mexico. Rather than using a motor or depending on your muscle power to squeeze the juice out over a ribbed cone, my lever-arm juicer is a squeezer, with the advantage of having leverage to squeeze out the juice from oranges and other citrus. Faster and easier than an electric juicer, it also gets more juice out of the orange. If you go to a fancy coffee shop, and want a “fancy” cup of coffee that’s not espresso based, it’s probably going to be made in a French press. This is one of the easiest ways there is to make coffee, but few kitchens have one anymore. The French Press is nothing more than a glass container with a plunger that has a screen on it. Coffee grounds and hot water are put into the press and allowed to sit for four minutes (I usually shave this considerably). Then the plunger is pressed down (hence the name), pushing all the coffee grinds to the bottom so the coffee can be poured off. Quick and easy, and even better coffee. Long before anyone invented the food processor, there was the grater. Food items were pushed across a variety of different sorts of blades, set into a stainless steel plate. The better graters had four sides, with different types of blades on each side. Food was shredded as desired, depending on the blade used. While modern food processors can do the same thing, most people just seem to use the chopping blades. Then they have to clean the whole thing up, which is much more work than cleaning a grater. Slicing apples is a pain, one that we put up with regularly. Yet this problem was solved long ago by using an apple slicer and corer. 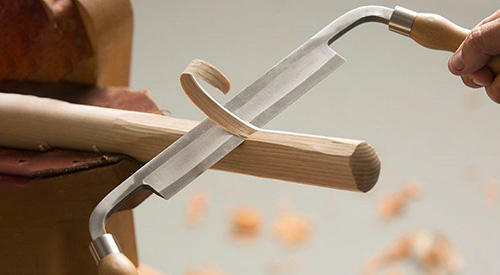 This simple device consists of a number of blades, mounted into a handle. 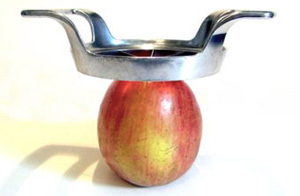 All one needs to do is center it over an apple’s core and press down. Presto! Apple slices, with no core. I don’t remember when the last time was that I saw someone use a manual eggbeater. Today we break out the electric mixer for just about anything, even if it is to just beat two eggs. To me, it’s much easier to break out a manual eggbeater and give it a spin. Not only does it do a great job, but it’s less cumbersome than getting out the electric one and putting the beaters in. If you put it in water right away, giving it a few revolutions, it just about cleans itself. The meat hammer is something else that’s rarely seen in the modern kitchen. Instead, we use chemicals to tenderize our meat – chemicals that really aren’t all that good for us. It would be a whole lot healthier and not a whole lot harder to use a meat hammer to break down the meat’s natural fiber and tenderize it. Since homesteading is about being self-sufficient, most especially in growing your own food, it only makes sense to look at tools which will help with building things and gardening. If we’re going to be self-sufficient we need to be able to make what we need, as much as possible, rather than running out to the store to buy it. That takes knowledge, skills and the right tools. Back before there were hardware stores everywhere, filled with factory-made tools and hardware, you couldn’t count on just hopping on your horse and running across town to buy what you wanted. Rather, you’d go to the blacksmith and order the hinges for your door, a pair of pliers, or andirons for your fireplace. He’d make them to your order, having them for you in just a few days. I’ve seen blacksmiths at work; my dad was trained as one. It’s amazing what they can do with a forge and anvil. While the blacksmith was the expert, there’s a lot that people can do themselves if they have a forge and anvil. That was common on homesteads and ranches. Granted, we might not be able to do artistic work, but we can build a lot of basic things we need. If you don’t have a sawmill available to you, wood splitting wedges allow you to split logs, either for making split log floors and furniture, or to turn them into rough-hewn boards. Once logs are split you need to straighten and smooth the surface. This is where the adze comes in. This tool looks like a big flat scoop, mounted at right angles to the handle. Used with a swinging motion, it cuts out the high points on that split log, making it possible to flatten and smooth it. The drawknife is an incredibly useful tool for working with logs of all types. With it, you can strip bark, smooth a log, shape it into an axe handle and even make wheel spokes. Gimlets have to be the simplest way there is of drilling a small hole. They are essentially drill bits, permanently mounted to a D handle. Usually limited to a maximum size of ¼”, you can drill holes into wood faster with a gimlet than you can get your cordless drill set up and into action. For heavy-duty drilling, the carpenter’s brace is the way to go. A two-handed tool, one hand provides downward pressure, while the other hand is the “motor.” Even though you can’t drill as fast as you can with an electric drill, you don’t have to run extension cords or recharge the battery. When the power goes out, the carpenter’s brace will replace the cordless drill as the tool of choice. Leather has long been a useful material for making a variety of things. Stitching leather can be hard, though, especially if you aren’t used to it. The sewing awl makes this much easier, combining the functions of the awl and the sewing needle.You literally stitch as you make the holes. That makes it much faster to stitch leather together. It can also be used for other heavy materials, such as canvas. I’ve had plenty of frustration pulling nails out of boards so that I could reuse them. If you’ve done any carpentry work, you have too. The claws on a hammer just don’t do the job. But back in the 1800s they had a nail puller that worked, even on nails without heads. It combined the jaws of pliers with leverage. Puling the handle both tightened the grip of the pliers on the nail’s shaft or head and provided the leverage to pull it out. It works better than anything invented since.